Posted on 22, September 2016 by EuropaWire PR Editors | This entry was posted in Automotive, Education, Energy, Gas & Oil, Netherlands, Technology and tagged Bouwe Bekking, Corinne Vigreux, Nuon Solar Team, Sasol Solar Challenge, Technical University Delft-based, TomTom, TomTom Telematics, WEBFLEET fleet management solution. Bookmark the permalink. AMSTERDAM, 22-Sep-2016 — /EuropaWire/ — TomTom (TOM2) today announced support of the Technical University Delft-based team in the Sasol Solar Challenge. TomTom will be providing the 8 students with its flagship products to help them propel this year’s car, Nuna8s, towards victory. The team, who won last year’s World Solar Challenge, is laying the foundations for the future of driving through its innovation in designing solar powered cars. 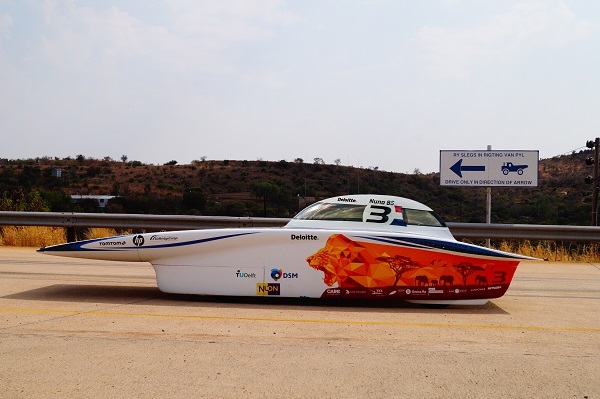 The Sasol Solar Challenge is held in South Africa every two years and is an impressive demonstration of leading technology and the sophistication and performance of solar powered vehicles. Starting on 24th September, the global competition will see participants travel from Pretoria to Cape Town covering up to 4,500km in 8 days on solar power alone. TomTom is providing the Nuon Solar team with its technical, product and data expertise* in order to ensure that they can plan the perfect race. With the event taking place on public roads, TomTom’s data and routing devices will be critical in helping the team gain a competitive edge. The TomTom Telematics WEBFLEET fleet management solution will track and connect all the support vehicles in real time and TomTom’s sport watch and action cameras are also helping the team with valuable data and support during the race. TomTom Telematics WEBFLEET fleet management solution – Helps the Nuon team to track where their cars are, if any of its convoy of cars are in trouble, for example if they get lost, stolen or have a technical breakdown. It also helps to connect the team and keep them up to date on what the competition is doing. In addition WEBFLEET enables the team to calculate the average speed needed at different parts of the route to win the race. TomTom Geobase Search API – Helps check speedlimits which enables the team to calculate average speed needed at different parts of the route to win the race. TomTom Routing API – Helps to check the traffic density real time. Enables the team to calculate average speed needed at different parts of the route to win the race. TomTom Maps API – Prevents the team from getting lost, but also helps to check the route in the Netherlands. Also provides important tactical information such as the slope of the roads and good places to overtake. TomTom GPS – Helps to ensure the team is on the route exactly, needed to calculate what the average speed needs to be at different parts of the route. TomTom Bandit – Constantly films Nuna, when something goes wrong, the team can look back and see what went wrong and why. Also used as proof towards the organization if/ when wronged by third parties and get undeserved time penalties. TomTom Spark – Used to check how the drivers are doing under certain circumstances in Nuna by checking their heart rate. Also used as back-up option for the drivers to see the speed of Nuna if the onboard information breaks down. Next to this all three drivers see it as an extra motivation to work out and stay fit to drive Nuna.